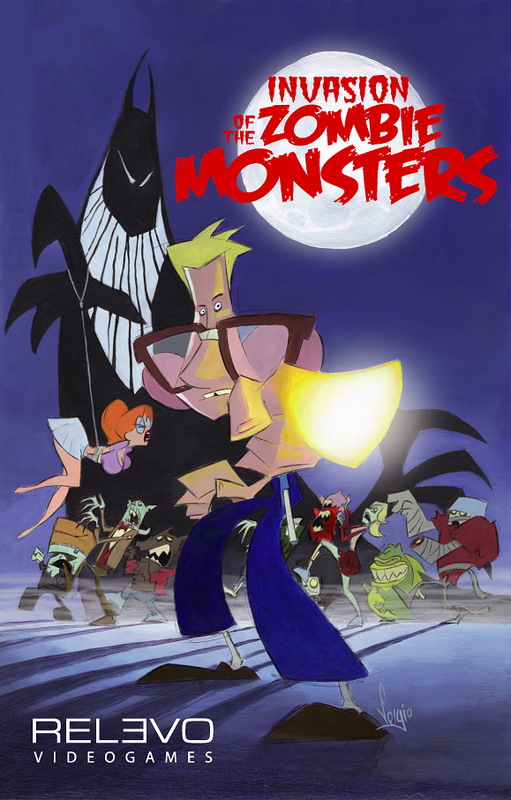 True to its obvious sources of inspiration, Invasion of the Zombie Monsters starts off similarly to Ghosts 'n' Goblins, which comes to mind foremost from the midst of a good number of games: your girlfriend is kidnapped by an evil monster, and you are given some mystical powers to defeat the enemies and bring back the girl. It's cheesy, predictable, overused, but oh so fitting to the b-movie style, and you have to love it. 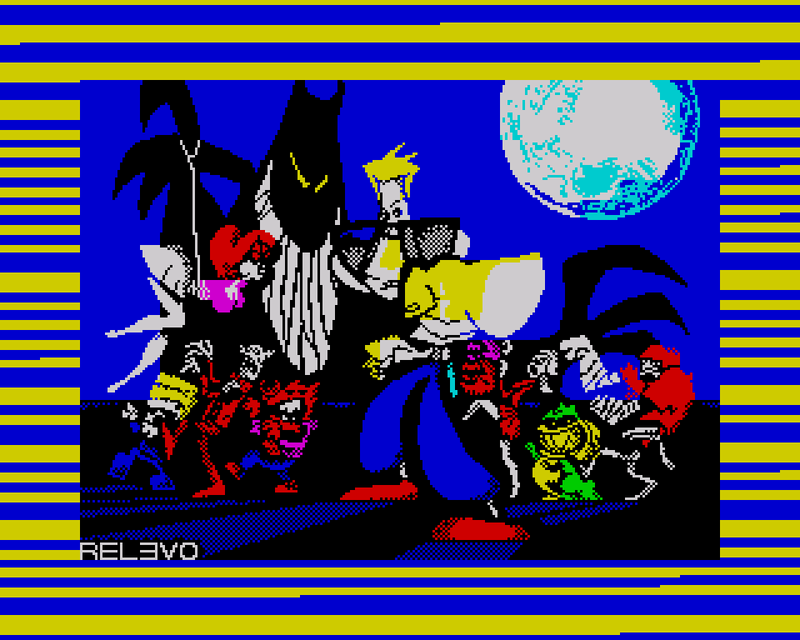 Loading screen from the Amstrad CPC version. The game features five levels of progressively harder platforming and shooting, with new enemies in every level and an end-level boss in most. Your weapon of choice is a magical projectile of moonlight power, which can be upgraded four times with bonus pods dropped by defeated enemies. The other dead enemies which don't drop bonus pods, usually drop coins, which you can collect to receive extra lives. And that's all there is to it, really. Simple, but effective, and yes, even quite addictive. Rather remarkably, all three versions play almost exactly the same, as far as I am able to tell. The only really notable difference is in the control methods. The SPECTRUM version has the option for two different joysticks (Kempston and Sinclair) and redefinable keys, while the MSX version can be played on the cursor keys or joystick, which ever you prefer. Only the AMSTRAD version has been restricted to the otherwise very familiar QAOP + Space Bar setup (at least for Spectrum gamers), so there should not be too much to complain about, other than the lack of joystick support there. As the game has no ladders or doors or anything of that sort, the controls are simply: left, right, jump, crouch and fire. There is also a pause button, and a different continue button in every version for when you get a Game Over and want to use a credit. It's not much, but it's different. Now, I should explain something of the game mechanics. As the game is so very much a platformer, the most important thing about it is jumping. The jump height is always the same, and you can count it as character blocks, which would make it 5 blocks high. This can be for both your advantage and disadvantage, since you have to be measuring your moves quite often. Crouching can save a character block's worth of room above you, which can often save you from flying enemies, but you can't move while crouching. At least you are able to shoot all the time, but you do have a moderate firing rate, so you should save your shooting frenzies until the end-level bosses. I have often found myself unable to shoot an enemy within three to four blocks because I've been in a frenzy, so I cannot put enough weight on these words: measure your moves. Whether or not you are able to enjoy it, the scrolling is done by blocks as well (8 pixels, I think? ), so it is fairly easy to measure your moves, even though it might get a bit heavy on your eyes, if you are not accustomed to the scrolling method. As a traditional platformer, which Invasion of the Zombie Monsters very much is, the screen will only move from right to left, so you cannot go backwards. Therefore, it is highly recommended to learn all the different movement patterns of all the monsters, as well as their abilities and weaknesses. All the levels have a very distinctive design, so you need to be concentrating quite a lot on different landmarks and patterns, so you won't waste any more lives than you have to. I have to admit, that this game frustrated me to bits for the first few runs, but after I started finding and remembering all the patterns, it got easier. To be sure, it plays as much like a classic platformer as you should want for it to, minus the slightly blocky scrolling. That said, the only other thing that makes any sort of difference to the playability is the game/scrolling speed, which is slightly quicker on the MSX than on the other two, but even that is stretching the quest for finding differences here a bit far. Although I managed to beat the game on every platform, I decided to only give you graphic examples of the first two levels, just to leave something for you readers to find out all the surprises for yourselves, in case you haven't played this game yet. All the necessary points to be made for this section can be found within the first stage anyway. But of course, we need to start from the beginning. Screenshots from all versions of the intro sequence. Top row: MSX. Middle row: ZX Spectrum. Bottom row: Amstrad CPC. Already, we can see some clear differences between the three versions. What you can't see here is that all the intro bits have slightly different sorts of fading effects, each of which are nice in their own way. As for the bits you can see - it's clear that the SPECTRUM version has the least colours in use, and the AMSTRAD obviously has the smallest screen resolution, but lots of colour. The MSX version seems to have the best of both worlds - lots of colour and high resolution. 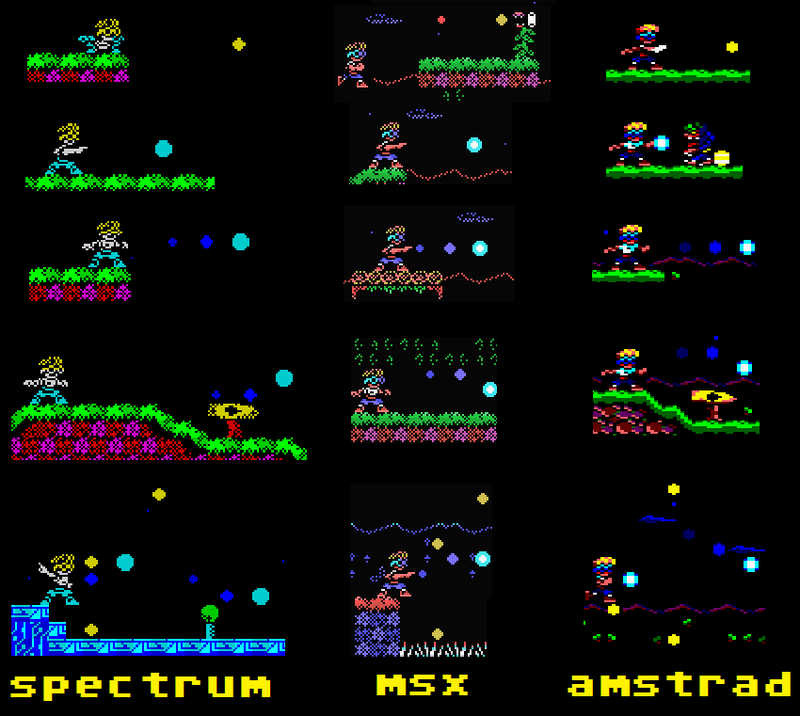 Title screens, from left to right: MSX, ZX Spectrum, Amstrad CPC. Yes, it's a simple but very stylish title screen, so I can't really say anything about the title itself. The only obvious difference here is the amount of control options you have on each version. 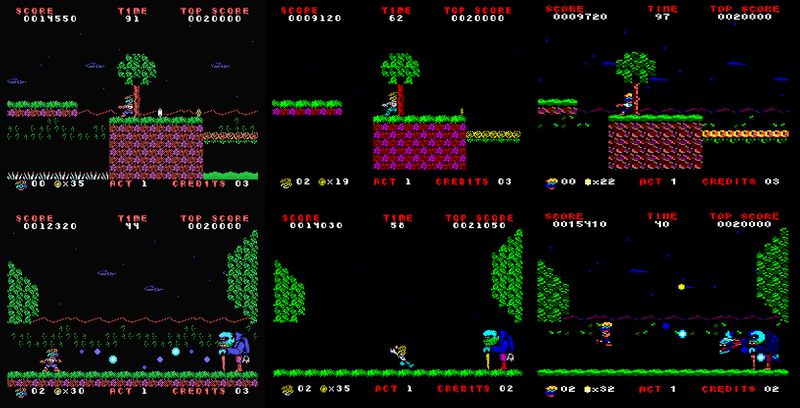 Map screens: Act 1 - MSX, Act 2 - ZX Spectrum, Act 3 - Amstrad CPC. Before every level, we get one of these map screens, along with a description of the upcoming level. It has Castlevania and Ghosts 'n' Goblins written all over it, and that's probably the whole idea. What I said of the three versions when comparing the intro bits, still holds true. MSX, ZX Spectrum, Amstrad CPC. If the differences haven't been clear enough so far, the amount of detail in the level backgrounds and the overall amount of colour is what set the three versions apart from each other, since all the versions use the same scrolling technique. Although the AMSTRAD version seems to have the most colour in it, the MSX gives it a proper run for its money, and beats the SPECTRUM version in every single area, apart from the screen resolution, which is the same. Since you can actually get the highest upgrade for your weapon during the first level, if you play well enough, I might as well show you the different stages of your weapon on all the versions. The lowest form is a single straight-shooting little yellow bullet. The second one is clearly a more powerful form of the moonlight power projectile, but can only do as much damage as the first one. The third one has a tail of sorts, and can now do more damage as well, so that enemies that required two bullets to be killed before, can now be killed with one. My least favourite version of the weapon is the fourth one, which has similar tail to the previous one, but is just as powerful, and does an irritating snake-like pattern. The highest form still keeps the snake thing going on, but two yellow bullets have been added to the mix, and these two fly diagonally up and down to the direction you are facing. I think I need not comment on the differences, as it would be repeating the obvious. Once again, the differences are plain to see. One thing I can say about this game that it certainly has going for it: the difficulty of taking interesting screenshots without dying. Anyway, I think we have a fairly clear idea of the outcome for this section. Since all the machines utilise a similar AY-type soundchip (not counting the 48k SPECTRUM, of course, the version of which has no sounds at all), it might come as no surprise that all the versions of the game sound very similar to each other. Only the AMSTRAD conversion has some fairly minor sound type differences to the other two, and at least when playing on an emulator, some of the sounds felt a bit out of tune, but it's barely noticable. What was more noticable, was that all the music was half a step below the original key, but it didn't make it any less effective. Back in the day, it would have been considered quite a remarkable achievement to having been able to include a tune for each level, as well as the intro sequence, map screens and the Game Over screen - and then fitting a good bunch of rather nicely made sound effects to be played on top of it all. Sure, it's an accomplishment even today, particularly on such limited hardware, but I have gradually started to notice, that this is pretty much the expected standard of modern games on old machines, particularly when writing games to be commercially sold. Considering strictly from a hardware standpoint, I think the MSX version might be the most impressive one, but purely sound-wise, they're all pretty much on the same level. All that aside, I think the soundtrack is a perfect fit for the game's overall atmosphere and style. There are some pseudo-scary cartoonish horror-like graveyard tunes, some nicely funky action tunes and as much of Nintendoesque bits as you would ever want on a non-Nintendo game. I'm not sure if that makes any sense when put in words, but play the game, and hear it for yourselves. It's all there in the map screens, game over screens, deaths and boss fights. 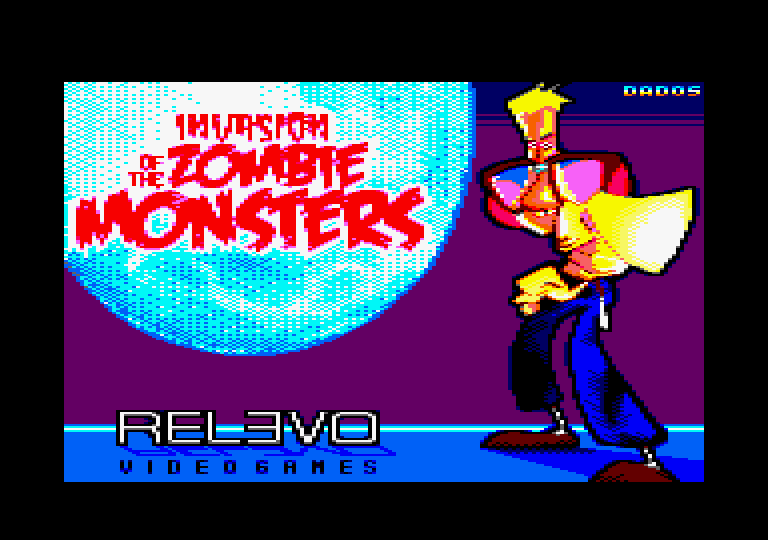 Invasion of the Zombie Monsters is a very solid effort, and a fine example of combining the modern humorous sensibilities to an age old game genre with a good amount of nostalgia in the mix. It has no actual horror elements in it as such, being a very tongue-in-cheek piece, but Halloween is about so much more than just horror and graphic slaughter, which is the other of two reasons why I took it under my magnifying glass now. Being as it is such an obvious tribute to Ghosts 'n' Goblins and the like, I'm not entirely sure if I would go so far as to call it a modern classic quite yet, but if nothing else, it easily deserves a place on any list of new games that people who are getting into a new retrogaming phase should take a look at. And I do believe, that is the first time an MSX version has won the comparison, which makes it the second first time winner within one month! Quite interesting, don't you think? Seriously ? speccy's version has no background "paralax" scroll effect and really poor choice of colours... how can it get better graphics or overall note than CPC ? Well, I can't honestly give you a perfectly good answer for that. 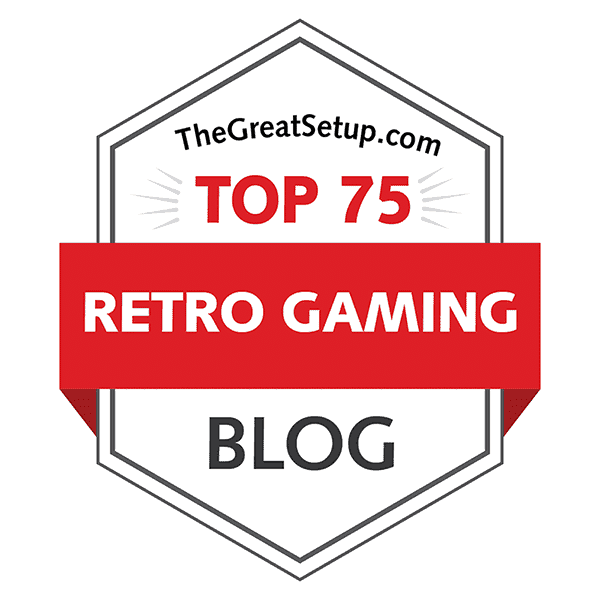 Because I have chosen to give approximate scores like old magazines used to for these comparison articles about new games, I haven't really bothered to make a completely accurate scoring system. This is just more of a roundabout way of showing how I feel about each version than anything, and I'd suggest you take it with a grain of salt. Besides, in this particular case, I needed to take into account the fact that the Spectrum version was made before the CPC version, and I have no idea, if the parallax scrolling graphics came as an afterthought for the CPC and MSX versions or not. 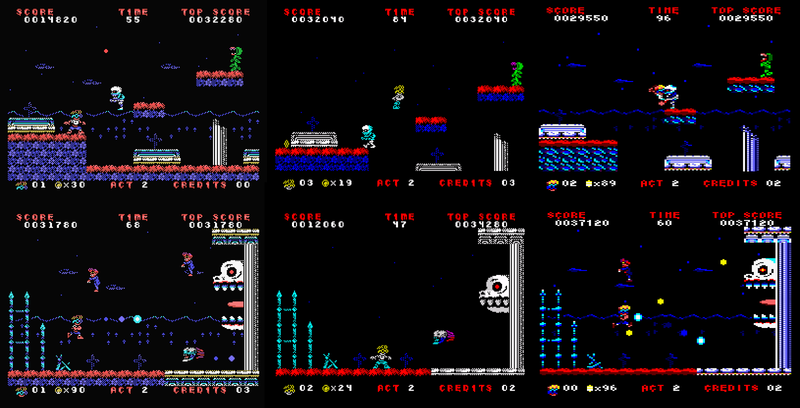 I don't think the Spectrum version's colours are poorly chosen, I just said there weren't as much of colours used there. This comparison was made a long time ago, so I'm not entirely sure on my memory here, but I think the reason why I chose to give the Spectrum and CPC versions' graphics the same score is because they're both equally good in various different ways - in my opinion. In case you didn't notice, the CPC version lost to the Spectrum one because of its sounds, and the reason for it was that some stuff was out of tune.